This is a sponsored conversation written by me on behalf of Duracell & Toys "R" Us. The holiday season is coming soon and we have been making our wish lists! Star Wars is a big deal at our house so we've been adding cool new Star Wars costumes and toys to our list as we've been counting down to the release of the new movie on December 18th! This month we are pretty excited to partner with Duracell and Toys R Us to share about some cool Star Wars lightsabers and our newest Star Wars inspired shape crafts for kids! We are also giving away a $100 Toys R Us gift card so scroll down to check out the details! 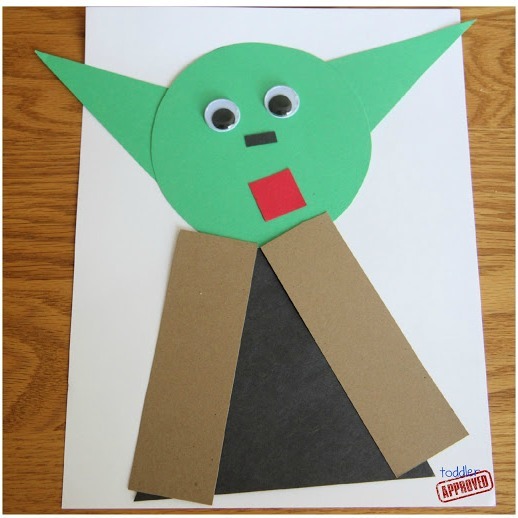 Not long ago for May the 4th we shared a simple yoda shape craft. 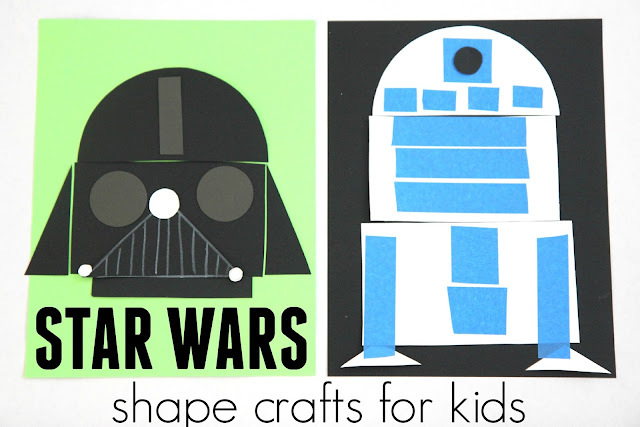 Today we have added two additional Star Wars inspired shape crafts to our collection- a Darth Vader shape craft and a R2D2 tape shape craft. These crafts are for preschoolers and older! Make sure to scroll down for the full tutorials including the free printable templates. 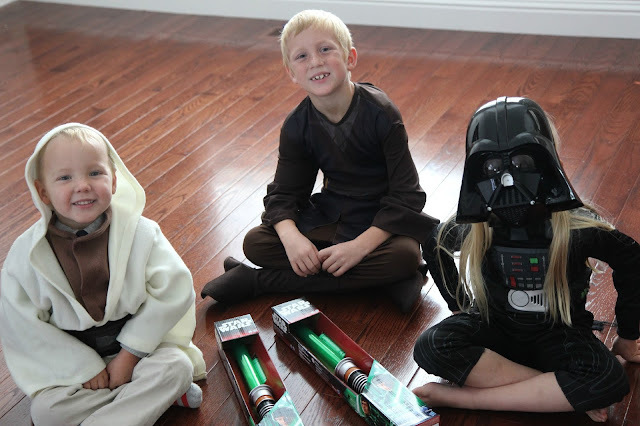 A week or so ago we were sent two Luke Skywalker Light Sabers from Toys R Us to try out. The kids wanted to open them immediately and play with them! First they had to get in costume though. My littlest was a Jedi, my oldest was Anakin, and my daughter was Darth Vader. 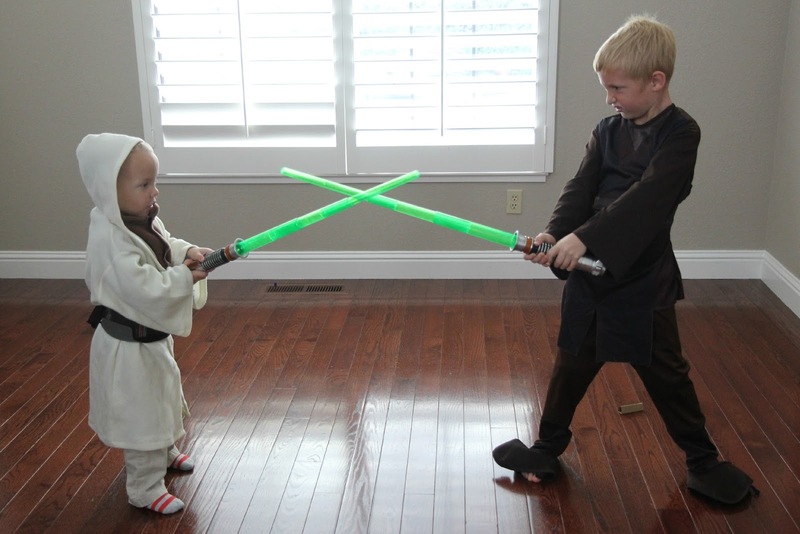 We have dressed up as Star Wars characters several times for Halloween, so the kids love pulling out their costumes and lightsabers on a daily basis for lightsaber duels. The kids took a few minutes to examine the boxes and check out the cool pictures and directions and then they started ripping them open!! They only needed a little help to get everything out. I typically hate battery operated toys because I always forget to buy batteries and then the kids get so frustrated that they can't play with their new toys right then and there. Once the kids got the lightsabers out they opened them and dueled a bit... but based on the box the kids were pretty certain that the lightsabers were supposed to light up... so they started hounding me for batteries! You'll definitely want to pick up some Duracell AAA batteries before you open up your lightsabers. Hooray for Duracell batteries that came through in a pinch! We just needed a screwdriver to quickly open up the battery area and we dropped three Duracell AAA batteries into each lightsaber and closed up the doors and they were ready to use immediately! The whole process to add the batteries only took a minute or two. Once we powered up with Duracell batteries the lightsabers made motion sensor-controlled sound effects like clashing, battle impact and crackling sounds. They also shot out some cool light designs from the tips (like a flashlight with a swirl design) so the kids had to turn off all of the lights once it got dark outside to check out the designs. The Star Wars Revenge of the Sith Luke Skywalker Electronic Lightsabers that we were sent also came with a bladebuilder piece that allows two lightsabers to attach to one another to make an extra long double lightsaber. The kids had a blast lightsaber dueling and trying out the sounds all afternoon. Although we love playing with our lightsabers without batteries... there really is something extra cool about a lightsaber that lights up and makes clashing sounds like you are in battle. You definitely don't want to forget the batteries this holiday season! I highly recommend that you take a trip to Toys“R”Us for the best selection of Star Wars toys sometime soon as well. 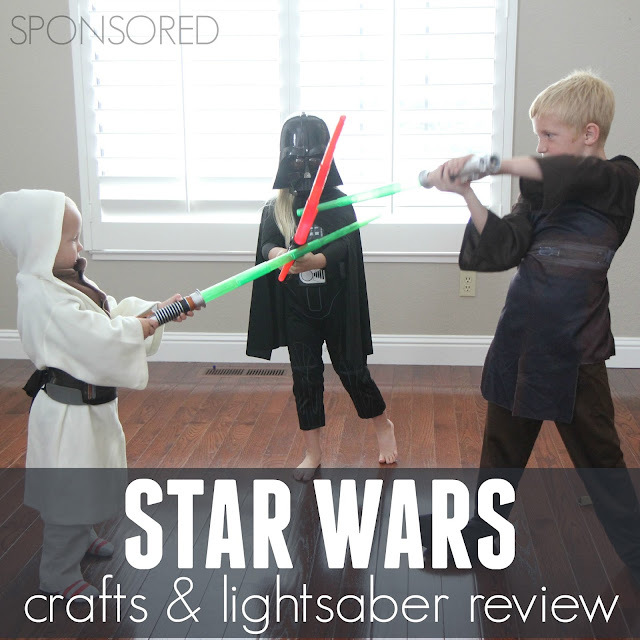 Lightsaber playtime can get my kids excited and energized... so we usually like to pull out a sensory project or craft activity to help my kids take the energy down a knotch. 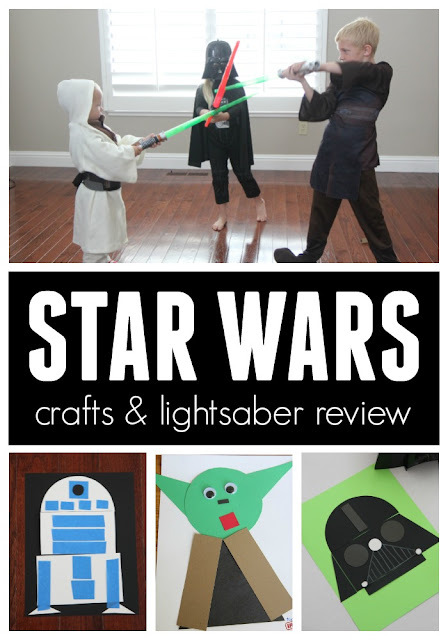 These Star Wars Shape Crafts are one of our favorite ways to craft together and work on simple fine motor skills like cutting, taping, and tearing while also having fun! This craft is so easy to make! Just print out the template onto white cardstock and cut out the pieces. 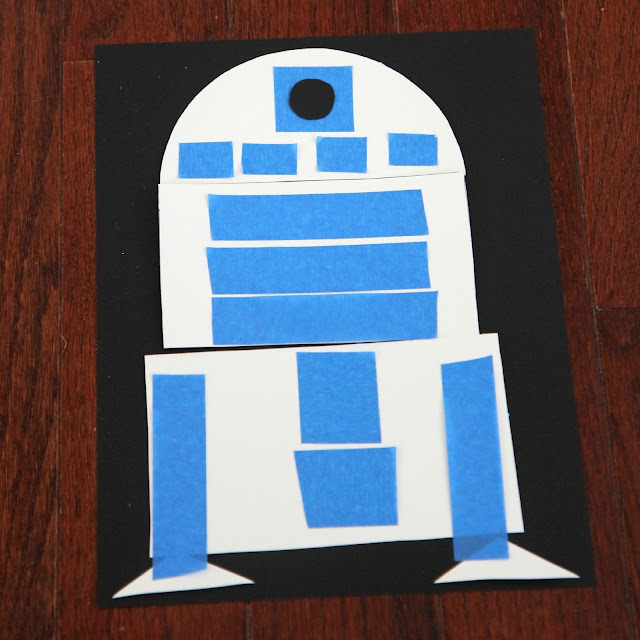 Have your child arrange the pieces on another piece of paper to make an R2D2 outline and glue them in place. Next grab some blue painters tape and add some details to your white R2D2 to give him buttons and knobs. You really can't go wrong with this so just encourage your kids to have fun snipping the tape and moving it around to make their R2D2. This is another super simple shape craft! First you'll need to print out the template onto white cardstock and then cut it out. Then you'll need to trace the pieces onto black, gray, or white paper depending on what the template says. Once you have the pieces traced, cut them out. Lay out all of the pieces and then you can start creating! 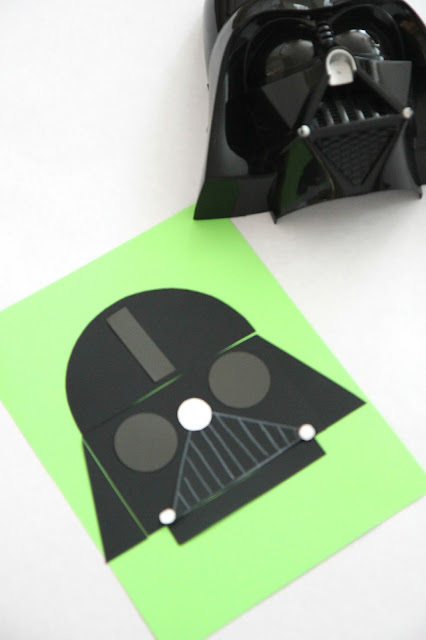 Add some white lines to the big triangle with white crayon to create a mouthpiece grate for Darth Vader's mask where he can breathe. Once you've arranged all of your pieces then you'll want to glue them onto a piece of cardstock. You can also just laminate the pieces instead of gluing them down and create a shape busy bag activity to put together again and again! Head on over to our Yoda Shape Craft tutorial HERE for more details regarding how to make this super simple shape craft. 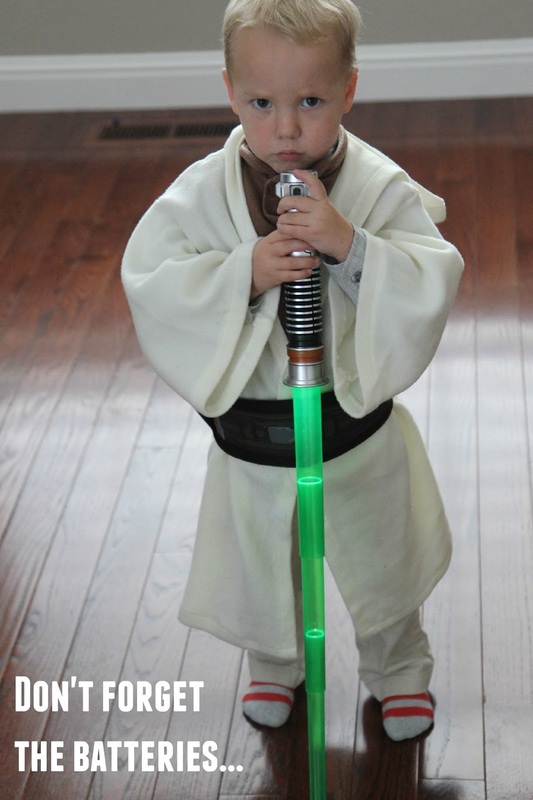 Are your little Jedi's excited about the upcoming Star Wars movie? Do you have anyone at your house that wants some Star Wars Toys from Toys R Us? (or any toys from Toys R Us for that matter?) Check out our Toys R Us Giveaway below! Toys R Us and Duracell have generously provided a giveaway of a $100 Toys R Us gift card plus Duracell batteries for a Toddler Approved reader! Enter the giveaway below. Giveaway ends at 12:00 a.m. on Sunday November 22nd. Giveaway is for USA Residents only. This is a sponsored conversation written by me on behalf of Duracell & Toys "R" Us. The opinions and text are all mine. My daughter wants a doll house for Christmas! My son's birthday is December 22nd and his family activity is for us to all go see the new movie. He desperately wants the big Bladebuilder!!! This is such a fun way to practice shapes! My son wants a telescope for Christmas this year. My girls want a kitchen for Christmas! Cute R2D2 craft. My son wants Star Wars Legos. My 4 year old son has been begging to use the blue painters tape since we made a freeway on the ground last week (an idea we snagged from you). Can't wait to tell him he can use it to make R2-D2!! Bonus-may actually get my hubby to participate in a project with the boys!! Huge Star Wars fans here. Thanks for sharing! My granddaughters want Chase from Paw Patrol and Sing along Elsa. My son wants an XBOX One. My daughter wants arts & crafts kits and a Wii U! These crafts are too cute! I love it! I think my 17 month old may just try to eat the construction paper, but I may give it a try! Thanks for sharing. My kids want a Wii U for Christmas. I want a iPad 2. My grandson wants Legos for Christmas. My kids are in college so all they want is money. I'd love a pedicure. My kids want anything related to paw patrol or star wars! Seems like my kids keep adding items to their wish list. One item all three are asking for is Lego's. Always a hit. My daughter wants a Furreal unicorn. Anything Star Wars related, they love Star Wars. My daughter wants a life sized Darth Vader, she loves Star Wars and of course she wants a Doc Mcstuffins costume. I want a waterproof camera. My niece wants a Doc McStuffins Lambie. My daughter wants the Starlily Unicorn! My son would love a set of light sabers -- he is a star wars freak! I know he would also love some new lego sets. My son wants a crayola double sided easel. My granddaughter wants anything Bath & Body Works. I want a cupcake carrier. Oh he really wants the Thames & Kosmos Wind Power 3.0! He is in love with wind turbines! My son really wants one of those zoomer dino toys. My children have asked for Star Wars Lego. My boys both want a scooter for Christmas! My daughter would like a record player. My son wants anything college football related. My daughter wants an iphone. She would love anything Doc McStuffins! My son wants a remote control helicopter.Thanks for this chance!! My nephew loves Star Wars especially Kylo Ren! My daughter would like a Cabbage Patch Kid doll for Christmas. My son would really like to get a bike for Christmas. My oldest daughter wants a lifeproof case for her phone and my youngest daughter wants arts and craft supplies. Thank you!! My son would like a skate board! For my husband truck to be able to be fixed and in good running order. My son wants a remote control truck. My son wants a new computer. My daughter really wants a tablet for Christmas. My son wants a telescope. I have 2 daughters under 2. We are getting the older one a drum set because she loves music, & the younger one a walker that changes to a ride-on toy later. My kids really want Lego Dimensions for their XBox One. My grandson wants one of those hover boards. A new desktop computer would be very nice. My grandson wants a go kart this year. My gand daughter wants a doll. My oldest son wants a ps4 but he can keep wanting lol. My son wants Star Wars Battlefront video game! For Christmas I want a Keurig coffee machine. I would love to have a new tablet to read ebooks in bed. We would like to move. It's what all of us want the most. We all want to move; we want a new place to live. Our little guy would love the Go! Go! Smart Wheels Ultimate RC Speedway. I don't have any kids, but I would love an X-box One. My son wants a new watch! For Christmas we would love (and need) new winter shoes, nice and warm winter shoes! Thank you for this giveaway! My son really wanted the Leonard figure that turns into a play thing. My daughters wanted new toys!